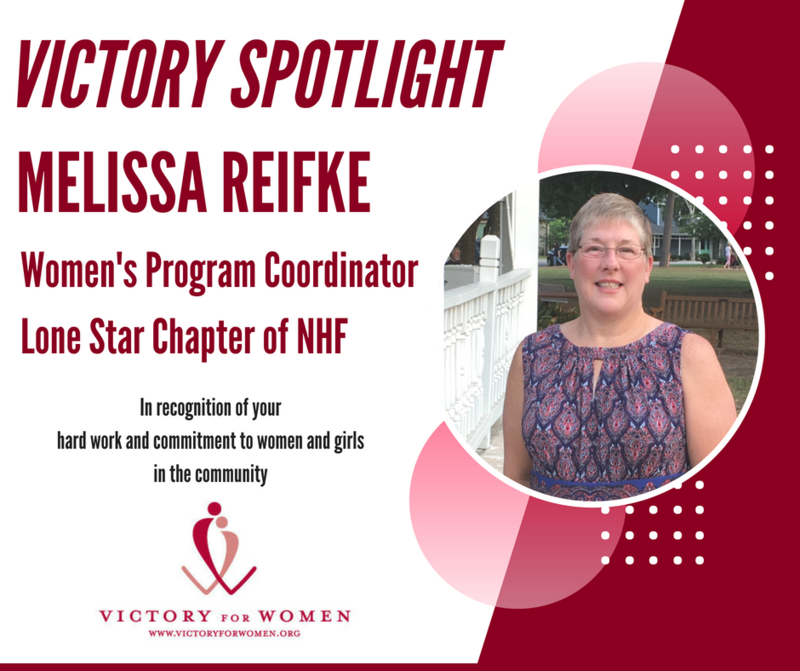 We are pleased to introduce our newest Victory Spotlight honoree Melissa Reifke, Women’s Program Coordinator of the Lone Star Chapter of NHF and the Women’s Retreat Director of Empowering Women with Bleeding and Clotting Disorders. The Victory Spotlight is a woman who has demonstrated her commitment to making her voice heard on behalf of women and girls with bleeding disorders through education, advocacy, mentoring, and service. We salute Melissa’s dedication and ability to understand the unique needs of the women and girls she serves with an uplifting spirit and tireless effort. Melissa is a proud born and bred Texas gal. She enjoys sports, especially gymnastics, as well as travelling, working out, cooking, gardening, and spending time with her family. Melissa has been happily married to her wonderful husband Mark of 21 years; they have two children – a son, Robert, who is 28 years old and a daughter, Grace, who is 27 years old. She was instrumental in the creation of the women’s program ‘SHE,’ and the 2017 recipient of the Lone Star Chapter of the NHF Phil Blomquist Volunteer of the Year Award. She has also spent time as the Board Secretary, a local EMT, recreational and competitive gymnastics and cheer coach, medical assistant, paraprofessional and bookkeeper. We interviewed Melissa to hear more about her and her amazing work in the community. What is your current involvement in the bleeding disorders community? Currently, I work with the local chapter to organize educational programs for the females in our chapter that are affected in any way by a bleeding disorder. The females could be the mother of a patient, the sibling of a patient, or could be the patient themself for example. I also participate in the chapter Hemophilia Walk each year and I assist with the Women’s Bleeding Track at our Texas Bleeding Disorder Conference. On a regional level, I was on the Planning Committee for the Great Plains Women with Bleeding and Clotting Disorders Women’s Retreat and Girl’s Camp for 15 years. In 2017, the retreat/camp was reorganized and renamed. At that time, I became the Board President for Empowering Women with Bleeding and Clotting Disorders Women’s Retreat and Camp Dare to Soar Girl’s Camp. o You’ve been involved in the community for over 20 years. What is one thing you’ve learned about yourself that influences the work you do? During the time that I have spent with the chapter and the women’s retreat/girls camp, I have learned that no one has to feel alone. We have a family in the bleeding disorder community that is always there for us. It doesn’t matter if your bleeding disorder is mild or severe. It doesn’t matter if you have Hemophilia A, Hemophilia B, or VWD. We are all important. We all matter. We are all family and we are all there for each other. Describe one of your proudest moments of your work in the community with women and girls? At this past year’s Lone Star Chapter Houston Holiday Party, I was named the recipient of the Phil Blomquist Volunteer of the Year Award for our chapter. It was not only a surprise but it was a tremendous honor to receive this award. There are many things that can motivate a person, but for me, it would be the look on the face of a female when she meets another female at one of our events that is going through the same things as her. To know that the events I organize can possibly make a difference in a person’s life by giving them hope, encouragement, and support can also be life changing to me. I am pretty open about my life but there are a couple of things that most would be surprised to know about me. One thing would be that my husband and I eloped shortly after I graduated high school and didn’t tell our families till three days later and he had already returned to Camp Pendleton. We parted ways within a year but were remarried to each other 13 years later and have been happy as can be ever since. Second, most people are shocked to learn that while in college, I took coursework to become a diver paramedic. Part of the program involved learning to hard-hat dive and underwater welding. During one of our dives near the Houston Ship Channel, another student and I were in the water and had an alligator pass directly in front of us. Due to the murky water we didn’t realize it until the students and instructor on shore told us through our communications line what was happening. It was an experience that I will never forget. Stay tuned in the next few weeks to hear more from our Victory Spotlight! Thank you for all that you do! 0 Comments on "Victory Spotlight "